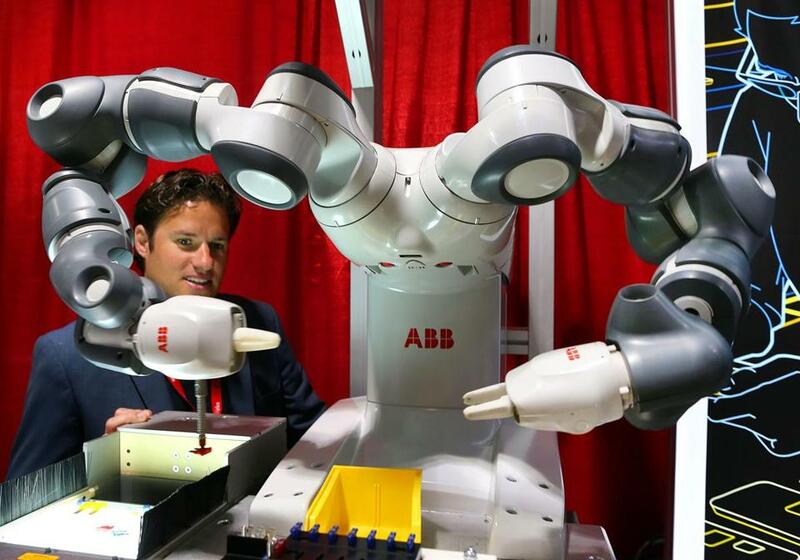 Nicolas De Keijser of ABB watched a robot in action at the Boston robotics conference. It looks simple in the “Star Wars” films, where brave and resourceful robots work side-by-side with heroic humans. But in real life, getting too chummy with an industrial robot could get you killed. It happened at least twice last year, at a car parts plant in India and on a Volkswagen assembly line in Germany. “In most factories you go into, the robots are walled off behind cages,” said David Mindell, a professor of aeronautics and astronautics at the Massachusetts Institute of Technology. That’s because robots aren’t programmed to interact safely with fragile and unpredictable humans. But Mindell and other robot engineers are now building robots that can work safely alongside people. And many of those robots are on display in Boston this week, at a conference where the world’s top robotics companies are demonstrating that their creations can come out from behind their cages and work in human-robot teams on the factory floor. 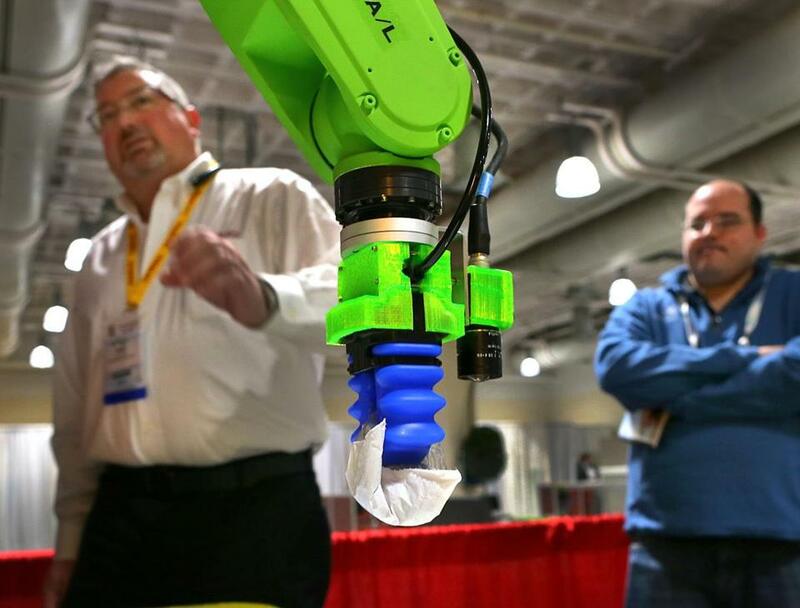 The conference of “collaborative robotics” at the Hynes Convention Center includes presentations from Switzerland’s ABB Group, Japan’s Fanuc Corp., and Universal Robots, a Danish company purchased last year by Teradyne Inc. of North Reading. The event is expected to draw interest from major manufacturing concerns looking to boost productivity. 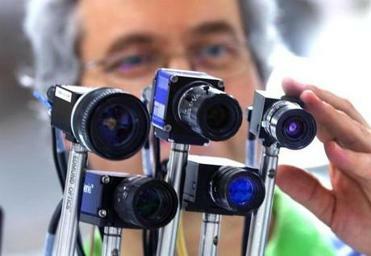 Werner Feith adjusted Gen-i-Cam cameras used in industry. Greater Boston’s home-grown companies are well represented, too, including Rethink Robotics, maker of Baxter, one of the first collaborative robots, Soft Robotics Inc., which makes flexible robotic hands, and Mindell’s own Humatics Corp., which is designing software and sensors for human-robot interaction. “One of the holy grails in robotics for many years has been full autonomy,” Mindell said. That’s the Hollywood vision of a robot capable of acting entirely on its own. But Mindell believes this is a mistake. Industrial robot makers are now bringing human-machine teamwork to the factory floor. Universal Robots, for instance, makes robotic arms that assist workers with repetitive tasks. Dynamic Group, a Minneapolis plastics company, uses a Universal robot to operate a molding machine, then pass the finished components to a human inspector. The molding machine now produces four times as many parts and uses just one worker instead of three. “As soon as we put the robot there, we started making the parts right, again and again and again,” said Dynamic Group chief executive Joe McGillivray. The displaced workers were reassigned to more demanding jobs. “We’ve got people who are doing things that are more interesting and more challenging,” McGillivray said. Universal Robots are designed for flexible manufacturers that make a variety of products. In such factories, the nature of the work changes from day to day. A Universal machine can be mounted on wheels and moved wherever it’s needed, and it runs on standard household current, with no need for special wiring. “We could bring a robot in now and have it running in five minutes,” said Scott Mabie, the company’s general manager. Workers can train the robot themselves by grabbing its arm and guiding it through the correct movements, or using a touchscreen controller to teach it precise moves. And there’s no need for workers to stay out of the machine’s reach. If any object gets in the way, the robot’s software instantly shuts the motors down; a human would feel little more than a nudge. Universal says that of the 10,000 robots it has sold, 80 percent operate in the open, with no need for safety fences. Universal’s biggest robot can lift up to 22 pounds. But even big robots can learn to collaborate. Fanuc’s CR-35iA, a heavy-duty machine capable of carrying 77 pounds, is suited to jobs like packing cargo pallets. Still, the Fanuc robot is well-padded and programmed to halt instantly when it bumps into a human. Yet even a mild nudge with a sharp object could injure a worker, and some robotic hands feature claws or wedge-like grippers that might cause serious pain. “You can take a very safe robotics system and make it very unsafe with the wrong kind of hand,” said Carl Vause, chief executive of Soft Robotics in Cambridge. His company, based on technology developed at Harvard University, uses soft, flexible plastic grippers that can wrap around objects from a cardboard box to a ripe tomato. But because they’re so flexible, the Soft Robotics grippers won’t do much harm to anyone who gets in the way. It’s been 55 years since the first industrial robot was switched on, and they’re only just learning to play nicely with factory workers. House-training will take a lot longer. A Fanuc Robot CR-7iA retrieved a bag of screws.